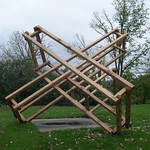 Illinois artist Jeff Boshart worked in residence at Luther College September 17 - 22, 2007, creating three works of public art in collaboration with Luther students. 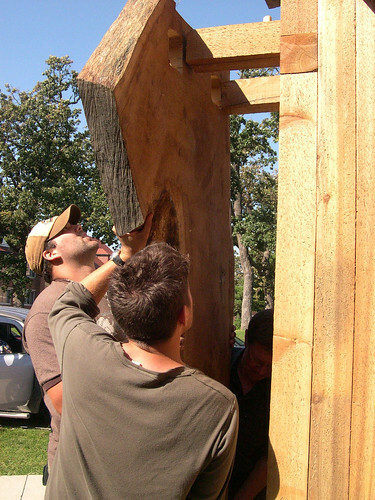 A wooden piece in front of the Center for the Arts incorporates large oak slabs harvested from the CFA site when the building was constructed. 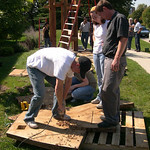 Boshart designed the piece and assembled it with the help of Luther students, faculty, and staff. 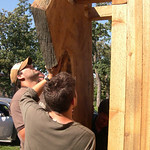 A wooden piece behind the Center for Faith and Life represents a combination of design possibilities developed by students in George Lowe’s sculpture class prior to Boshart’s residency. Both pieces reflect the artist’s interest in green sculpture, or the use and reuse of natural materials that compliment the installation sites and resonate with local context. 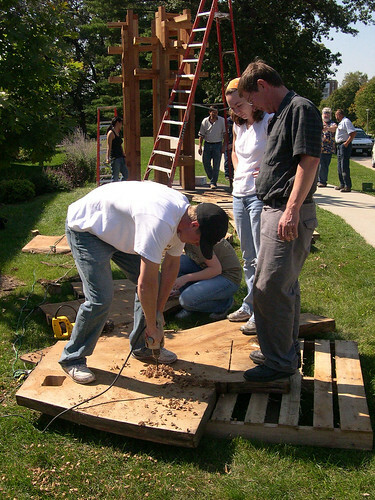 A third piece, suspended in the atrium of the CFA, balances yardsticks, hammers, and plumb-bobs is a postmodern interpretation of the “Last Supper.” The outdoor sculptures will remain in place during the 2007-08 academic year; the interior piece was removed shortly after the residency ended. 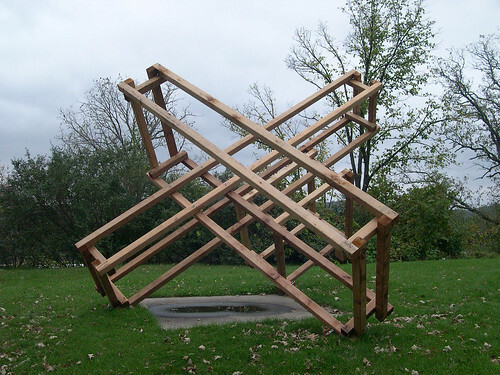 Jeff Boshart is a professor of art at Eastern Illinois University in Charleston, IL. He holds a bachelor of arts degree from Montana State University and a master of fine arts degree from the University of Massachusetts/Amherst. He is a member of several professional associations and has participated in numerous activities, both within academia and the community. His contributions to art education were recognized in 2007 when he received the Master Educator Award from FATE (Foundations in Art: Theory and Education) a national organization of post-secondary art educators. Boshart is a studio artist as well as a teacher, and his list of exhibitions, commissions, and workshops is extensive. Public collections containing his work include the Tarble Arts Center, Charleston, IL; the Milwaukee Art Museum-Cudahy Gallery, Milwaukee, WI; and the University of Iowa, Iowa City, IA. Additional information about the artist and examples of his work can be found on the Eastern Illinois University website.